I haven’t visited the Beaulieu Road Sales in a long while and was pleasantly surprised by the improvements that have taken place in my absence. The first thing that greeted me as I crested the railway bridge on the road leading to the sales yard was the sight of a very impressive covered sales ring. For a moment I was fleetingly reminded of Shakespeare’s Globe Theatre, London, – before it had its sides built. The surprises continued, with the discovery that over the past ten years there have been many other improvements in infrastructure, services and facilities – all thanks to funding and contributions from local supporters and the formation of the New Forest Livestock Society. There was a small area for trade stands, where one could buy all manner of tack and equipment, fresh coffee, hot food and even pick up information about the National Park Authority. It’s not difficult to understand why the Beaulieu Road Sales Yard is thought to be the best of its kind. It was a beautiful autumn day. The sun was shining, there was a gentle breeze and the temperature was cool but not unpleasant. The day started with a foal show. The foals on show were all halter-broken and obviously familiar with the lead-rein. It would have been difficult for me to have to choose one in each class. They were all adorable and very well behaved under the circumstances. 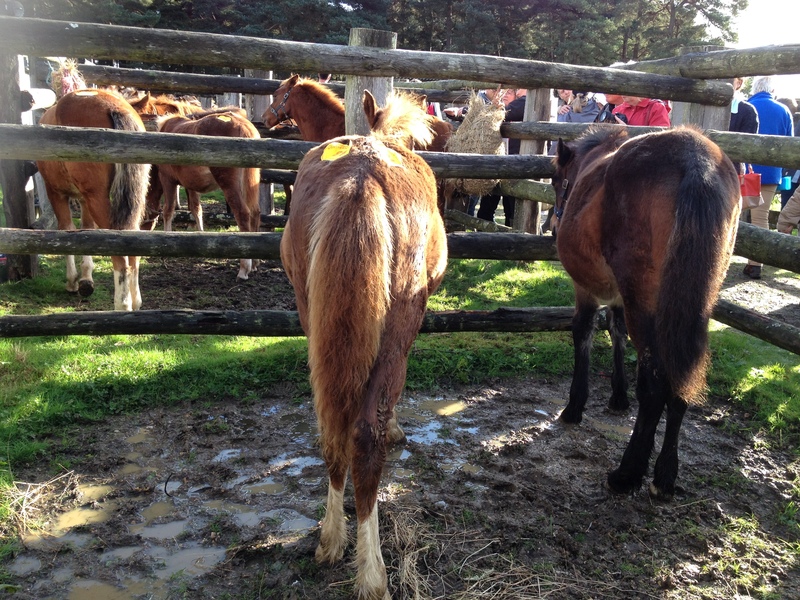 I spent a bit of time wandering around the viewing pens looking at the ponies. The catalogue had 194 lots listed. There were also breeds other than New Forest ponies on sale, and even donkeys. Mostly they were foals. Before the auction started lots of dignitaries filed into the arena and there were a few announcements. 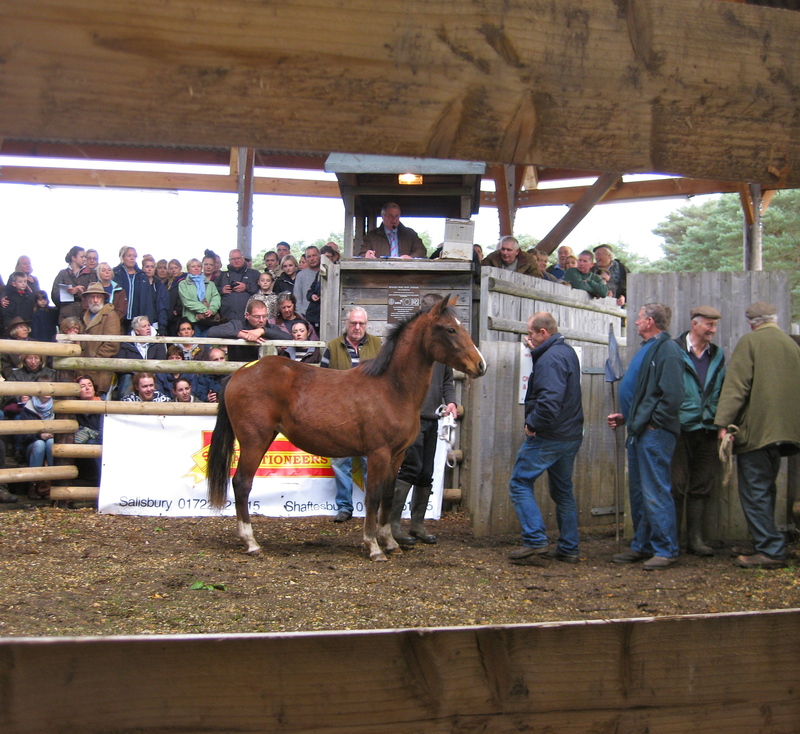 It transpired that the October pony sales were to be the very first held under the newly covered sales ring. (Previously there was no roof and site was open to the elements). I was to witness the ‘launch’! There was a long list of people to be thanked – particularly those who had helped to raise funds to finance the project and those who had worked above and beyond the call of duty to build it. Each timber, we were told, had been individually cut and joined, because no two timbers had been the same length! The timbers were made from Douglas fir, which is one of the tallest of the conifer family and is generally grown in environmentally-friendly sustainable plantations. Viewing pens at the Beaulieu Road Sales Yard. This entry was posted in Beaulieu Road Sales, New Forest, New Forest pony and tagged Auction, Beaulieu Road, Commoner, foals, Globe Theatre, National Park Authority, New forest, New Forest Livestock Society, RSPCA, sales, Southern County Auctions. Bookmark the permalink.